The economic reform in Serbia brought good progress and allowed the country to “compete with economies in the international market,” and our message is that the quality of economic reform is also of crucial importance, Head of the EU Delegation to Serbia Sem Fabrizi said. At the 11th annual conference of the National Alliance for Local Economic Development (NALED), he said that a substantial amount of work remains ahead in terms of public debt reduction, public administration reform, and women and youth employment. “In order to boost the capacity of Serbian economy and prepare it for the European market, Serbia needs to improve education and reduce parafiscal charges,” Fabrizi said. He noted that Serbia is seen through the “prism of readiness to accept EU acquis. So far, it has opened 16 negotiating chapters, which is the main indicator of its commitment to the economic agenda,” Fabrizi pointed out. According to him, the economic agenda is closely tied to the political, which is why the EU insists on the reform process at the core of which is the public administration reform, he underlined, adding that the same applies to the judiciary system. “Free and informative press are also part of that process,” the EU ambassador added. Fabrizi called the EU “natural and first supporter of Serbia” and pointed out that the Union accounts for 67 percent of total exports of Serbia, as well as 73 percent of direct foreign investment. “We are aware of the intricacy of the reform process, which is why we support it. 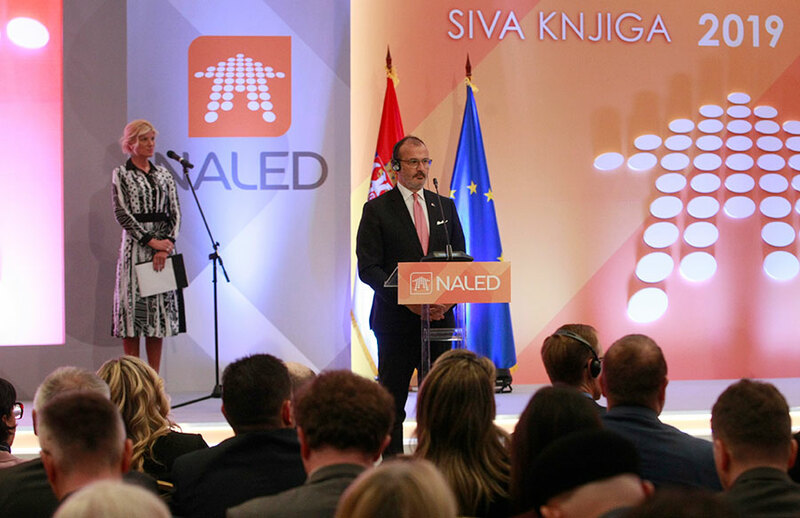 In previous years, we donated millions of euros,” Fabrizi said, stressing an important public administration reform project which is currently being implemented thanks to EU’s support of EUR2.5 million, aimed at reducing legal, regulatory and administrative barriers to doing business in Serbia. 2018 was a good year in terms of reform implementation. We believe that the quality of reform needs to improve while keeping their length and timeliness in mind, the EU ambassador said. Head of IMF in Serbia James Roaf said that Serbia has improved its business environment as it has achieved macroeconomic stability, reduced its public debt and kept the inflation low and stable, with a solid banking system, as well as employment and investment boost. He said that “much has been done, but there is still more to do ahead as Serbia needs to achieve a stronger economic growth in order to join the EU.” He also pointed to the need to improve judiciary due to legal certainty. Serbian Prime Minister Ana Brnabic said the government would engage in the reform even more vigorously and efficiently in order to improve the living conditions and business climate as much as possible. “The reform is not an end in itself… We are pursuing it for the benefit of our citizens and our economy. They are the road to a better business climate and the rule of law,” she said. The prime minister said that the success of reform is measured against country’s ability to bring positive changes to everyday life of citizens. “Over 130,000 cadastre applications in the first six months of e-cadastre show that we have successfully delivered on the basic goal of the reform and improved the lives of our citizens,” Brnabic said. She said that key recommendations from the business community – compiled in the NALED’s Grey Book – have been acted on, including declaring seasonal workforce in agriculture, introduction of e-cadastre and tax reliefs for emerging business people, among whom the young constitute the majority. During the conference, the NALED presented Director of the Republic Geodetic Authority Borko Draskovic with the Reformer of the Year Award for timely development of the electronic system.